Here’s the deal… pack up and leave! Pakistan Awami Tehreek (PAT) Chairman Dr Tahirul Qadri on Tuesday announced that he was ending his party’s 70-day-long sit-in at D-Chowk in the federal capital, claiming that the sit-in had turned into a revolution and now there would be sit-ins across the country. 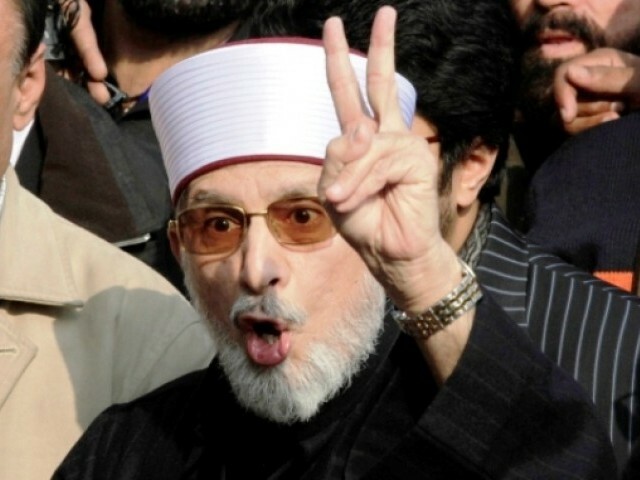 “The participants should pack their bags and return to their homes,” Qadri said while addressing his supporters. He also announced a schedule for PAT protest sit-ins across the country, saying he would hold protest sit-ins in Abbottabad on October 23 and in Bhakkar on November 23. A rally will be held in Sialkot on December 14 while another protest will be organised at Karachi’s Mazar-e-Quaid on December 25, he added. While Qadri insists that the PAT sit-in had succeeded in achieving its objectives, he denied that he was vacating Constitution Avenue after reaching a deal with the government. “We did not fail,” he said. “All our demands were not met and neither did we back down, as we did not want to make a deal with the government,” said the fiery speaker, adding that a deadlock between PAT and government persisted as both the parties were not willing to withdraw any of their demands. “We have our reservations about the government and we could not step back from our demand of resignations of Prime Minister Nawaz Sharif and Punjab Chief Minister Shahbaz Sharif,” he claimed. However, contrary to the firebrand cleric’s claim that the decision of ending the sit-in was not the result of any deal with the government, Pakistan Today had disclosed on October 3 that the two sides had reached a written understanding for a ‘face-saving’ exit of the Canada-based cleric. The agreement, a copy of which is available with Pakistan Today, makes no commitment to Qadri about an impartial probe into the Model Town tragedy and neither gives any assurance on formation of a follow-up judicial commission to investigate the matter afresh. Per the agreement, the government agreed to withdraw all cases against PAT workers and leaders, including Qadri. The accused in all, except nine cases, would be cleared after a probe by a Joint Investigation Team (JIY) headed by an officer mutually agreed between both the parties. “That the parties will create conducive environment for healthy political activities as guaranteed under the Constitution and Law; That the Party No.1 (the government) will withdraw all the cases registered in Islamabad and Punjab against leaders and workers of PAT in the wake of recent agitation except the following 9 (nine) cases,” states the agreement. These nine cases will be investigated by a JIT composed of mutually agreed members and headed by a senior police officer. These nine cases relate to terrorism, which under the law could not be withdrawn without a thorough investigation by the JIT. “The JIT would be formed comprising a senior police officer nominated by the head of JIT; one police investigation officer i.e. SHO; one member from Intelligence Bureau; one member from either ISI or the MI. The persons involved in these nine cases will not be arrested during the investigation except with the permission of the head of the JIT as per requirement of law,” the document states. Meanwhile, a statement from the Prime Minister’s House said that Prime Minister Sharif had barred all parliamentarians of the Pakistan Muslim League-Nawaz (PML-N) to desist from passing any rude comment against the PAT leadership in wake of the party’s decision to call off the sit-in. The stubborn Imran Khan is getting isolated because of his obsession. Imran Khan has made himself into a joker by his U-turns and fake deadlines which by all mean nothing. He has wasted billions of rupees while IDPs and flood victims suffered. Who cares about his conditions to end his protests? Let him keep protesting every day until next elections in 2018. This will teach anti-democratic forces that there is nothing that will destroy the democratic process in Pakistan. NAAPAKIS -ENEMIES OF AAM AWAAM – IMRANKHAN FIRANGIGUALMS GOONS NIGHTCLUBS DARBAANS..AND NAZIS FACISTS QUADRIS MULLAS MUSHARAF COWARDS HIDING BEHIND OLD 90YRS OLD MOTHER .. WHERE ARE ISI TRAITORS CLAIMING TO BE PATRIOTS- SCRIPT WRITERS KAAFIRS ..
JAMSHED- u GO SC8M GO ..U GO ..IMRAN GO ..KAAFIRS GO .. GO TO HELL ..
Imran Khan & his followers are full of hypocrisy. He has been dancing on the tunes of people like Sheikh Rasheed and fooling blindfolded followers. He defaulted his electricity bill payments to IESCO and started using the generators (which the majority of people cannot afford). Yesterday, his party was caught smuggling diesel from KPK to the generators of IK. The KPK Govt Vehicle AA-2522, Supplying Diesel for Dharna Generators in Islamabad belongs to Deputy Secretary of KPK and various Tv channels have shown it Live. Imran Khan, you can fool some of the people some of the time, but not all the people all the time! Hilarious Article, How can i believe that this is the text in that agreement, if it was signed between the two parites! This article is a bluff until it is proved properly with images of agreement!